Waterfront Toronto, and some other supporters of this plan, have unleashed a new wave of “it’s too early to kill the deal”/”everything is fine”/”calm down we’ve got this”/”it’s not a done deal” and various iterations on the theme in response to calls to shut the project down. The CEO of Waterfront Toronto recently said no can do because “you would be looking at a lot of lawsuits”. With this in mind, consider how Sidewalk Labs continues to run the game on framing the conversation around data governance. Below is an excerpt from a recent Q&A document created for Waterfront Toronto’s Digital Strategy Advisory Panel. Andrew is Andrew Clement, a member of the panel. This is not the time to entrench the status quo data environment, or current norms, into any future plans. It’s an example of the problematic inevitability thing that tech companies do and brainwash everyone else into believing — “the data that is already being collected by existing organizations occurs every day already in our world and will continue to occur in Quayside.” Says who? I get that Sidewalk had to respond to the question, and this is a small thing, but still — inventing things like “traditional” to describe this data? I mean, come on. It’s time to look at every commercial and public sector data collection and data usage scenario that exists today and think about them on a spectrum — with practices considered somewhere from helpful to fine (if poorly understood by the general public) to completely predatory. Yes, it’s a lot of work. It would also begin to support the creation of a new regulatory baseline, taking nothing about the status quo as a fixed condition. This is the imagination and leadership opportunity that’s fading fast here. Is Alphabet going to do this work? Is it going to do anything to shed light on how what it’s planning here connects to its current business models? Has it done anything over the last fourteen months with its millions of dollars to educate people about the pre-existing data governance environment and the ways data is currently being collected and used? No. Because it has no incentive to do this. And that’s not its job. What does it have an incentive to do? To entrench as much of the status quo as possible within and around its business plans. And yes, a data trust could be set up to do that too. Dan Doctoroff has been trying to normalize as much of the status quo as possible since Sidewalk Labs crisis-launched its data trust proposal: “I think for all but the most extreme advocates, it should answer the vast majority of questions,” he said. No. Not even close. There will be trust posts to share next year. Setting that aside for now, consider the current data governance landscape. The GDPR is an evolution not an end point. Montreal, Amsterdam, Barcelona and many others are doing great things in data policy and around digital rights. Their work is pushing a huge boulder up a hill to mitigate a problematic status quo. It’s not time to just mitigate a little bit more when we are talking about this project. There needs to be a pause, a chance to completely turn the conversation around, and hold it properly. Slowly. Thoughtfully. Holding it properly does not mean only talking about how to mitigate this new wave of corporate-led data streaming in a testbed no one asked for. What about talking about data things that are already happening in Toronto that need to stop? Or perhaps be expanded? Where does the City really *need* more data to develop policy or support operations? What are the ways that could be done? What does collective privacy and privacy as a public good look like? What might need to be made illegal? City staff know a tonne about this and should (and probably will) be holding discussions that weigh their desire for more data in a trade-offs discussion with residents about the potential impacts of its collection. The conversation that should be happening right now regarding data is about how it ties to the city people want, not which defensive tactics to use in the context of forced pervasive data collection. Continuing to build municipal capacity regarding tech and data to support planning and operations should be the priority, not responding to a company because they picked Toronto as their urban laboratory. This is not an anti-business approach before anyone gets going. This is supportive of sound business practice. Get the social environment sorted with a municipal policy lens informing it all. Then continue on along with procurement. This is also the time to remember and embrace the legislative powers that governments hold, not a time to ask those that have been evading regulation for as long as possible to set the frame and define the rhetoric. 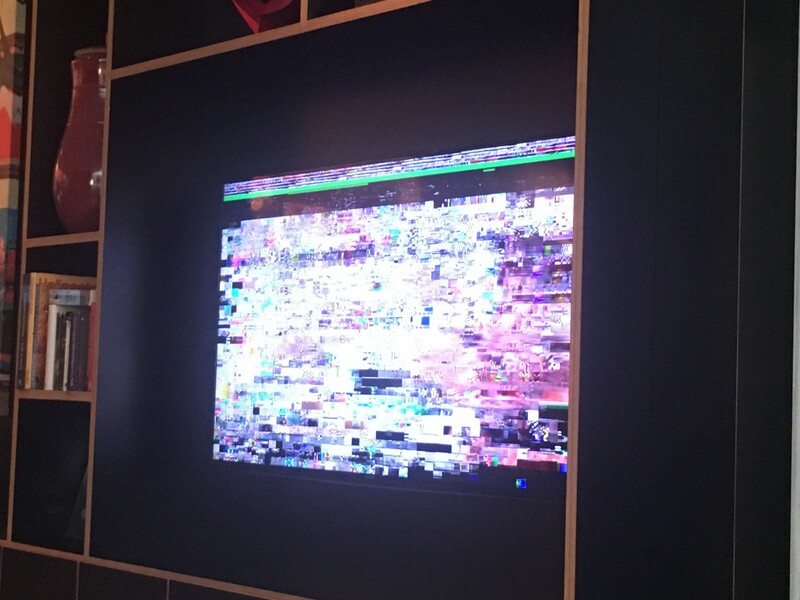 There is no such thing as traditional data. There is traditional manipulation though. 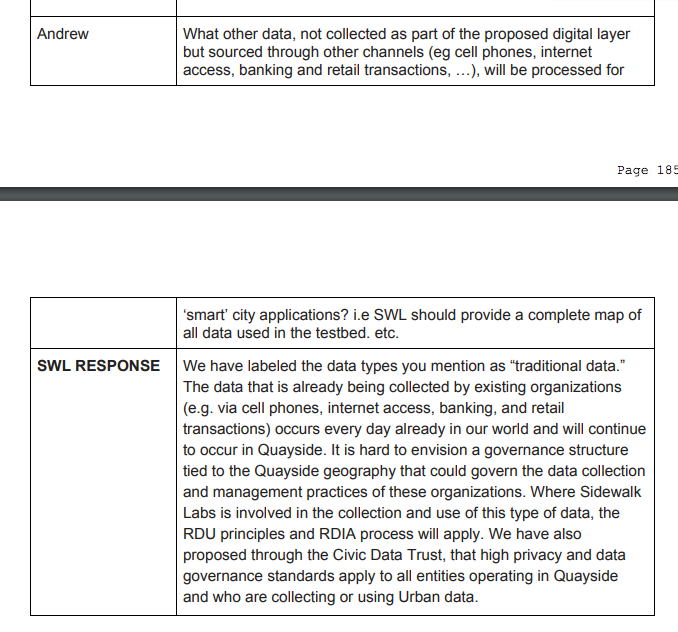 I get that Sidewalk Labs has to throw stuff out there on data governance - they agreed they would do so as part of this deal. Waterfront Toronto, its external advisors, its lawyers — they all thought that sounded like a good idea. To put a vendor in charge of this policy. Well it wasn’t and isn’t. How is this still happening? It’s surreal. It’s good that Waterfront Toronto is finally holding its own data governance sessions but it’s difficult to deal with the screwiness of the timeline — nothing about those sessions can fix that this has all happened out of sequence. The stealth of the flawed structure of this deal continues to manifest in how the future is repeatedly being framed by a vendor then edited and refined by the governments. The land and the tech and the infrastructure and the data aren’t things you can break into component parts and manage piecemeal, independent of each other in this deal. It doesn’t work like that. Alphabet has no right to be party to the debates on these digital governance topics for the next three to five years because they have “patient capital” — but that’s what this all really seems to come down to. They bought their way in. Smarter than Amazon but no less anti-democratic. Sidewalk is part of a company with a lot of money and the governments appear to be scrambling to access it in some omnibus plan that makes a solid case for not ever doing a procurement like this anywhere ever again. Is Sidewalk Labs heavily regretting the choice they made to sell this thing as a “neighbourhood built from the Internet up”? If so, we should count ourselves lucky that we can extract ourselves from this deal now rather than once they have any rights or connection to land, infrastructure, or anything else, which is when they could really start to think about what a neighbourhood built from the internet up means — and finally act on it. They don’t have to reveal that in any meaningful detail now, three to five years from when it would be built. It’s probably why the tech they present is either light-weight or unfinished. Who knows. And while yes, it’s still possible they really don’t know what they are doing as a business, that doesn’t make it ok. Not knowing what they are doing now does not preclude them from exploiting future scenarios that current governments are letting them be a part of. Reminder: Alphabet has about $100 billion dollars of cash on its balance sheet. It can afford to get messy and be patient. But we can’t. And we shouldn’t have to go on with this experiment that makes the surreal broken structure of this deal appear normal or harmless to people because they are thinking about traditional urban planning approvals. This project was too big a bite. People should stop choking on it already and just spit it out. Leave us the space to invent the future as residents of this city rather than be forced to defend it from the problems, power asymmetries, norms, and habits of the past and present. For a city that seems ashamed of its commitment to mediocrity this project is looking like a whole lot of exactly that. I still can’t tell what everyone is really playing at here with this thing so my usual disclaimer holds as always: I’m writing about one of the parts that I know about to keep trying to talk it out in public. I always welcome debate or challenges on it. There are many other arms to this omnibus octopus plan — with real estate and infrastructure/infrastructure financing factoring in as two big ones to get proper answers on yesterday. The project still has vanilla gentrification and P3 boondoggle potential written all over it too. But this all must be considered in tandem, and it really doesn’t sound like that’s what’s happening. It certainly isn’t what’s happening in the public consultation theatre. And yes, as more time passes, it’s ever more clear that the right thing to do is shut this down, get the policy and legal house in order, and start again. like what is going on with this plan ?